Astoria Buoy 10 Salmon action! Don’t miss out on the hottest salmon action of the year this August and September in Astoria, OR. The legendary Buoy 10 fishery is expected to return 1.3 million coho and 500,000 chinook salmon this year, almost double the amount of salmon which returned last year. Sky’s Guide Service will be targeting the upriver bright fall chinook starting on Aug. 15th out of Astoria with high expectations for this year’s run. Last year was excellent for both chinook and silvers and we expect 2009 to be even better. The daily limit of silver salmon increases to 3 on Sep. 1st in the Columbia River. 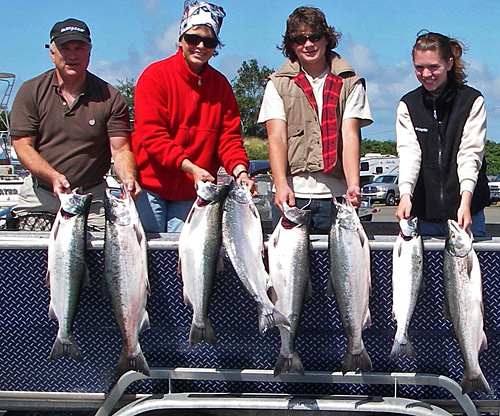 Make plans now to spend an unforgettable day salmon fishing on Oregon’s coast. You are currently browsing the Sky's Guide – Pacific Northwest & Oregon Guided Fishing Trips | Salmon Fishing, Steelhead Fishing, & Sturgeon Fishing blog archives for August, 2009.